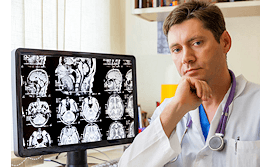 Brain Injury Attorneys in Texas! The short-term and immediate effects of brain injury can include symptoms such as loss of consciousness, bleeding swelling of the cranium and brain, concussion, coma, and seizure. The long-term effects can be even more devastating with resulting loss of memory, dizziness, loss of fine motor skills, violent mood swings, aggressiveness, and chronic headaches. nearly three-quarters of fatal bicycle accidents result from head injury and nearly two-thirds of bicycle injuries treated in emergency rooms involve head injuries. And while the use of a helmet can drastically reduce the risk, serious head trauma can still occur as the result of being struck by a car or truck while riding a bicycle. Cyclists and their families all over the Dallas-Forth Worth area have placed their trust in the Glenn Law Firm to pursue personal injury claims due to bicycle head injury. Talk to one of their experienced attorneys for free to learn about your rights as a victim of a bicycle accident resulting in brain injury. A blow to the head, deliberate or accidental, can result in a skull fracture and penetration. When these types of injuries occur, you need a lawyer to assess the situation, determine liability and fight for your rights as an injured person. The Glenn Law Firm fights for injured people and will work toward getting you the best settlement possible if you or a loved one suffer an open head brain injury. Open head injuries are either inflicted by way of extreme blunt force trauma or gunshot wound in most cases. Hunting accidents, construction accidents, and household mishaps can all contribute to or directly cause an open head injury. These injuries are extremely serious and often fatal. Bring your case to the Glenn Law Firm. They will thoroughly investigate the events leading up to and resulting in the injury or death and hold the person or persons at fault responsible. Pedestrian accidents which result in brain injury are most often the result of vehicular negligence but can also result from slip-and-fall accidents as well as debris or other projectile falling or being thrown from buildings. If you have been hurt by any of these types of accidents or have a loved one who has sustained permanent injury as a victim of traumatic brain injury as a pedestrian, call the Glenn Law Firm today to consult with an attorney. More than half of the cases involving cars and trucks striking pedestrians result in some degree of brain injury requiring years or even a lifetime of therapy to regain only partial mobility or functionality to various nervous system functions. The attorneys at the Glenn Law firm are experts at assessing the overall damages and projecting the monetary needs of injured people, even those whose injuries will require lifetime care and incur a lifetime of debt. The Glenn Law Firm is tough on negligent drivers and will go after the maximum settlement or judgment the law allows on your behalf. Glenn Personal Injury Attorney handles Premises Liability Injuries Owners of any type of property are liable for preventable injuries sustained on their premises. If you or someone you know has sustained a brain injury resulting from a slip and fall accident at someone else’s home or business that was the result of the owner’s negligence, don’t assume that the owner or insurance company will compensate you reasonably or fairly. Educate yourself. Know your rights. Call a legal firm that will hold the negligent party responsible and who won’t give in to a lesser settlement. Don’t take any chances with your case. If you’re seeking an experienced Dallas Brain Injury Attorney with Massive Trial Experience, Contact The Glenn Law Firm today.